The winter months are harder on my skin than any other months in the year. To keep my lips looking soft and kissable, I always have a few lip products in my purse to cover me during a dry emergency. I’ve always favored SoftLips, but I like a little color with my gloss as well. I decided to take a chance on LUSH, a company that makes all of their cosmetics by hand using only fresh, organic ingredients. Additionally, only humans test their products, and I really respect and appreciate that. 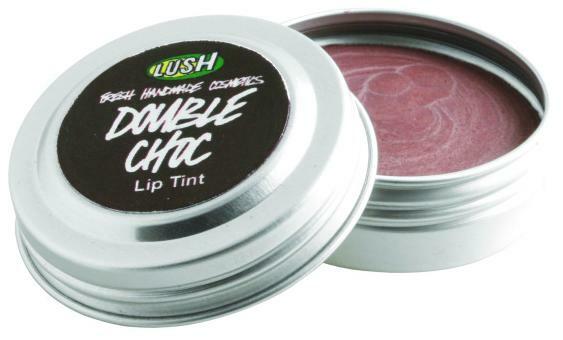 I was sent two lip tints for review: Double Choc and It Started With a Kiss. I’ve been known to buy cosmetics (especially lip glosses and sticks) based on their names, and I absolutely love the names for these. The lip tints come in .35 oz tins and are available on the LUSH website for $6.95 each. I tried Double Choc first, and was surprised at the rich color. I was expecting instead that it would be a light stain, but it competed with the big dogs in my cosmetic bag as far as color. Since it has a kind of matte look to it and I like shine, I coated it with a layer of clear gloss for a nice finish. Double Choc smells amazing, too, and it should since one if its ingredients is dark chocolate. You won’t be able to resist nibbling at your lips, and I don’t think your guy will be able to, either. It Started With a Kiss is a lot brighter of a shade than I normally choose to wear. I used a very conservative amount so it wouldn’t wash me out–I have a really pale complexion–and then completed the look with my clear gloss. I intend to play around with this one just a bit more and maybe combine it with a lipstick or tan-colored lip gloss to tame the color to suit me better. If you’re in a rush and need a quick dab of color, you can apply these lip tints directly to your lips. Since they are full of color, I’d suggest making sure you have a mirror on hand so you can ensure you haven’t missed your mouth (I’m notorious for missing, and I’m sure it doesn’t just happen to me). I’ve spent a little time looking around on the site and I’m really impressed with what I’ve seen. On some products, there are videos so you can see how the products are made. It’s also broken down by the ingredients so you can see what each one looked like before it was combined to make your tasty lip gloss. Quite a few of the products are vegan-friendly, so if you have a friend or family member who lives a vegan lifestyle, check out LUSH for some great gift ideas. And don’t forget to order a little something for yourself, too! I’ve never tried these products before but I like how it smells like chocolate and probably tastes like it too. The other thing I like is that they come in metal tins.